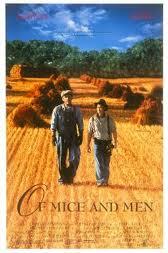 Of Mice and Men is set in 1930s America and traces the fortunes of two central characters, Lennie and George. The novella is still read today due to its sensuous use of descriptive language and its myriad of engaging themes. It is a popular choice every year for the Junior Certificate Studied Fiction section. Listed below are some resources that may be helpful in the study of this classic. 5. Bookrags.com with analysis of the themes of; frienship, dreams, animals and landscapes.